During the 3P Conference in 2014 in London, we got the idea of creating the first international Italian event about the Principles, and we wanted to start with the Chipmans, who, during the past 40 years have been teaching the Principles; first in Canada and the U.S. and then around the world. We decided to bring Chip and Jan to Italy, because of the wonderful feeling and the simplicity we felt listening to them. Through their stories and what they share about the Principles they allow us to enter that magical space within, where life starts flowing. In that space everyone can touch and experience their own true nature and when we feel it, we are able to have insights that bring us from a world of chaos into a world of peace and clarity. We are so proud to introduce you to the first international Italian retreat about the 3 Principles. Deep within the soul of every human being, regardless of the current circumstances of their lives, lies an innate intelligence so powerful, so unaffected by experience or conditioning that it is capable of seeing life with all of its complexity and challenges, with compassion and deep understanding. When our mind is free from the abundance of thinking, what remains is our true essence: a core of freedom, effortless creation, wisdom, love and lightness. Rediscovering your true nature is the purpose of this wonderful 4-day retreat. At the beautiful and tranquil setting of the Touring Hotel in Rimini, Chip and Jan Chipman will share with us a whole new understanding of relationships, the world around us and the spiritual nature of life itself. This is a retreat rather than a conference, with deep and impactful conversations, aimed at deepening the personal understanding of each participant. As such, sessions will begin at 10:00 A.M. each day, but the length of the sessions will vary according to the needs of the group. Time will be provided, in this beautiful setting, for reflection and the absorbing of insights and new-found understanding. There will be the space to chat individually with Chip and Jan or the Italian teachers, to allow you to have a very unique and wonderful experience. Chip and Jan Chipman of Vantage Consulting Group, Inc., are human relations consultants from Salt Spring Island, British Columbia, Canada. 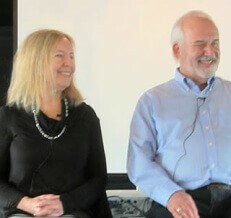 Mentored by Sydney Banks from 1975 until 2009, they hosted many executive and couples’ retreats with him in North America and Europe. For 24 years while in Florida, they served a wide variety of organizations throughout North America, from companies specializing in the hospitality industry to not-for-profit services, prisons and substance abuse centers. They currently enjoy sharing their understanding of the Three Principles from Salt Spring, through teleconferences, one on one Skype and telephone sessions and with individuals and couples who come to the island seeking a deeper understanding of the Principles and their own true nature. They have seen countless people find happiness and flourishing relationships as their own wisdom emerges after being touched by the original books and recordings of Sydney Banks. Chip is President of the Three Principles Foundation and, in 2008, at the urging of Sydney Banks before his passing in 2009, co-founded, along with Elsie Spittle, the Three Principles School, which is dedicated to sharing the simplicity and purity of “The Three Principles as discovered and taught by Sydney Banks”. This year the Chipmans will come to Italy for the first time and they are really happy to be with us at this retreat! € 897,00 (vat included) full price. Valid from the 27th of April up to the 26th of May.